Technology that's as cool as you want to make it. 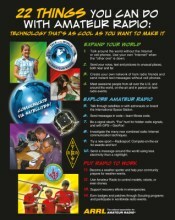 You'll learn 22 things you can do with Amateur Radio. Put radio to work and have fun doing it! Please note: A maximum of 4 packs of 25 will be included in one order.